The public space is investigated in terms of its energy self-sufficiency. 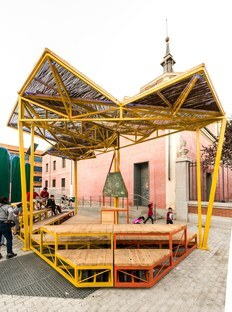 This is TANDEM, an “urban transformation process” created in Madrid thanks to the collaboration between Spanish studios Creática ONG, ENORME Studio, PEZestudio and TXP Todo X La Praxis to give life to three really sustainable urban fittings. Placemaking, the creation and use of a public space by citizens, is one of the most debated topics in today’s town planning. From north to south, many projects aim at improving the quality of urban life for citizens, but the sustainability of those interventions is limited to the ban of the cars from urban areas or the introduction of pedestrian and bike lanes, while practical aspects, such as the energy self-sufficiency of certain infrastructures, are not addressed. 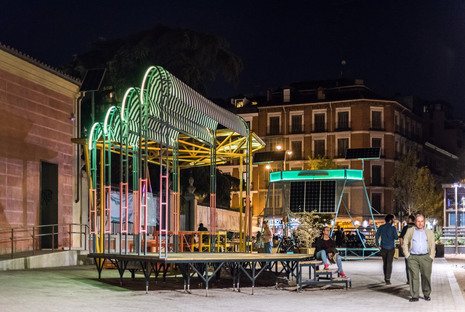 This issue was faced in Madrid, Spain, where the local administration wondered what would happen if public spaces could become self-sufficient in terms of energy consumption. 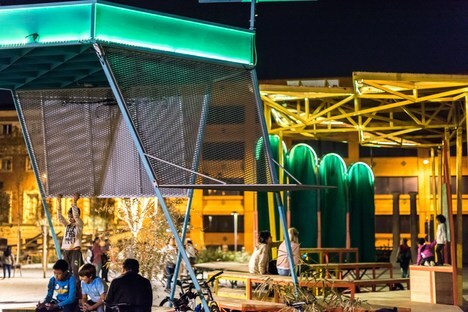 What if a public space could work as an urban laboratory allowing the citizens to manage energy? These questions gave birth to TANDEM, an urban experiment that involved a neighbourhood of Madrid, Malasaña, where three small architectures were created by four architectural studios based in Madrid, Creática ONG, ENORME Studio, PEZestudio and TXP Todo X La Praxis. 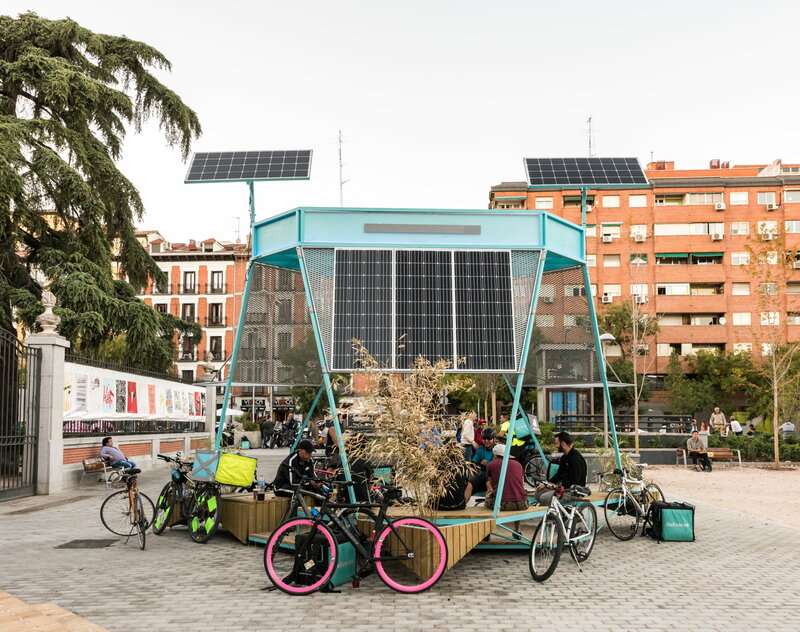 These are urban fittings for the public square Jardines del Arquitecto Ribera and include an open classroom, an open stage and an info-point capable to generate energy thanks to solar panels, and to provide the assembly with up to 2kW/h for its users’ daily consumptions. These three elements are connected to a Twitter Machine (@plaza_tribunal) that controls some interactions such as the possibility to switch the colour of the artificial lighting of the square, to make selfies using a webcam or to leave messages displayed on a LED screen. The LED screen is not just a “gadget” with recreational purposes: it also has a deeper meaning, as it allows to demonstrate that energy self-sufficiency can become a trigger for the activation, promotion and joint management of citizen activities in public spaces. Indeed, the generated energy is not only for individual use, such as charging electronic devices, but also for new, collective uses, such as the screening of movies during the summer or the lighting for concerts or other events. Energy self-sufficiency allows citizens to use the public spaces for initiatives that were not even conceivable before due to the absence of free energy allowing to realise them publicly. TANDEM is also an educational laboratory, as it educates the public about a responsible use of energy, making people wonder: “How can I use in the best possible way 2kW/h?” Moreover, access to energy could be a first step towards the process of making public spaces available for a great number of citizen initiatives, allowing to experiment a model of hybrid management by the City Council and the neighbourhood that can propose new methods for the joint management and use of public spaces. 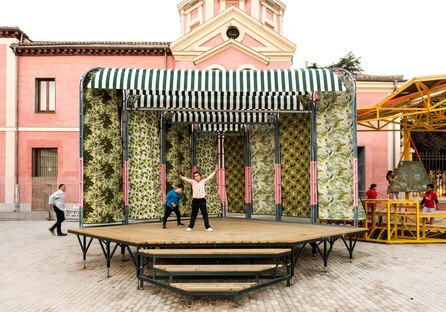 This way, the collaboration between Spanish studios Creática ONG, ENORME Studio, PEZestudio and TXP Todo X La Praxis started a real urban transformation process. You can find our friends from ENORME Studio, winners of Next Landmark 2015, at the Fuorisalone of the Milan Design Week 2018. Don’t miss them at the gallery of Rossana Orlandi that this year, with Senso di colpa (“Guilt”), will host a multidisciplinary project on the Green Economy devoted to the themes of recycling and sustainable design.